Description: WB between Main St. (Sellers Rd.) & I-75 undepass on NS main. Description: Caught this manifest in Missouri Valley and the country road to Persia IA they had suddenly stopped. Description: #4 Power on WB Stacks. UP 5117 is lead unit. Description: UP 9791 sitting in the corn at Joan Siding. Description: Look, I'm sorry. All Armor Yellow lashup sprints south around Bailey's. Description: Westbound reroute train passing through Brunswick, Maryland. Description: Detouring general freight led by all UP power cruises westbound by the CPL signal at Bailey's Wye in Baltimore. Description: NS 168 departs behind 180 with a nice consist. Description: UP's Engineer Jerry Stach adjust the chains on the SBTHR-09 before departing. Description: UP's SBTHR-09(Customer Special Beaumont, TX-Herlong, CA) military train waits to depart at Tower 87 on UP's Terminal Sub. with an ex-C&NW 8687 on the point. 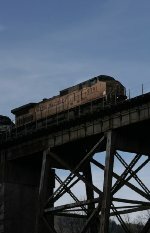 Description: A UP brings an NS train across the Whiteside Bridge over I-24. Description: UP 9791 trails 3rd on NS M4E eastbound passing East Wayne yard in New Haven. Description: CNW 8701 and UP 9791 awaits a signal on IG1G3 15 at Rochelle, Illinois on May 15, 2015.